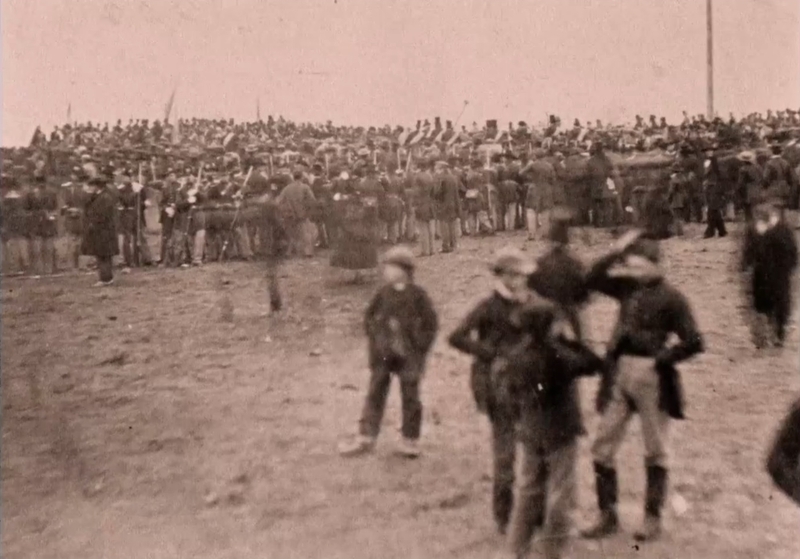 “The Civil War’s” Episode #5 — “The Universe of Battle – 1863” — is about 1.5 hours long. It begins with the image of a famous photograph by Mathew B. Brady and his team taken in Gettysburg about 10-14 days after the battle’s end. 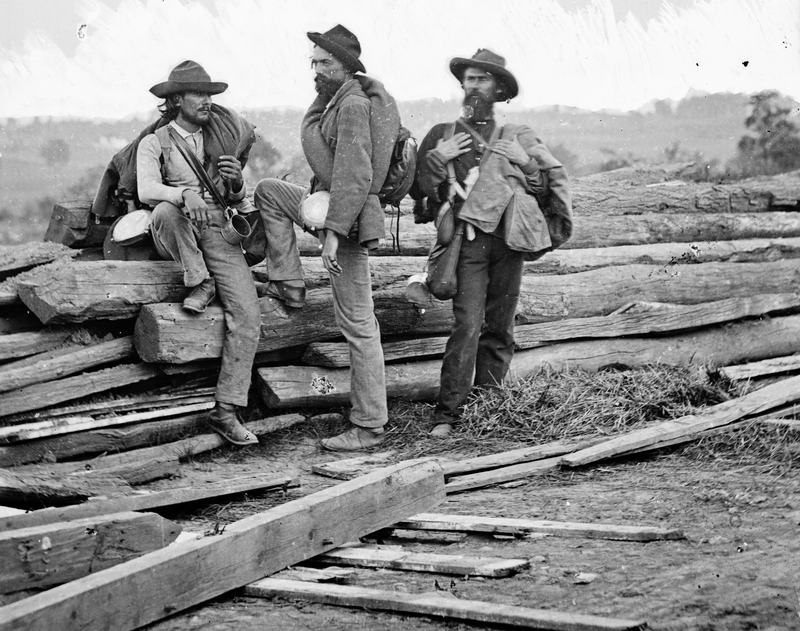 While showing this picture of three captured (or deserter) Confederate soldiers posing for Brady as if they were paid professionals, Shelby Foote lyrically emotes: “there’s something about that picture that draws me strongly as an image of the war.” Mr. Foote reveals that his fondness comes from his interpretation of the body language of one of the soldiers as that of proud defiance. Despite this segment’s short treatment of Lincoln’s Gettysburg Address, that particular title has evolved over time into one of the most important themes of the entire movie. Burns has repeated it over and over again in dozens upon dozens of interviews during the last 25 years in order to explain the modern relevancy of both “The Civil War” and the conflict itself. Oops, a blooper! Lincoln actually traveled to Gettysburg on the 18th and we as a nation are very lucky he did. There also would have been no serenading of Lincoln by the crowds in Gettysburg on the night of the 18th, resulting in Lincoln’s “First” Gettysburg Address. In that very short public address, Lincoln stood by an open doorway and joked that he had no speech to give and therefore, based upon past experience, would not give any. It was this address which many Northern Democrat-owned and Southern newspapers alike reported as Lincoln’s ONE & ONLY Gettysburg Address — for which they mocked Lincoln derisively. About a minute and half into “A New Birth of Freedom,” we come face-to-face with the print of a very famous photograph. Burns then focuses our attention exclusively on that photo over the next 66 seconds (a capture of the second shot of it from the remastered film in HD, below). It is a photo which was taken at the sight of the dedication of Gettysburg’s Soldiers’ Cemetery. And it’s original negative, sadly, has been lost to history. Of greatest importance is that it is the only Gettysburg photograph which is universally agreed to show Lincoln [to read about another which may also show Lincoln, click this link]. Yet Lincoln’s appearance within it wasn’t announced until February 11, 1953 after Josephine Cobb of the National Archives tentatively identified Lincoln. A consensus was reached over time that it is him. Ken Burns used this photograph in three separate and consecutive shots. In the first, he zoomed in on detail to the left, revealing some of the soldiers standing in a hollow square formation. They are turned to face towards the camera and strike a pose (the same detail from an image courtesy of the Library of Congress, at right). The second frame shows the entire photograph, giving some sense of the scale of the event (but not its full scope) and the distance the photographers were set up from the speakers’ platform and the crowds jammed around Lincoln and others. 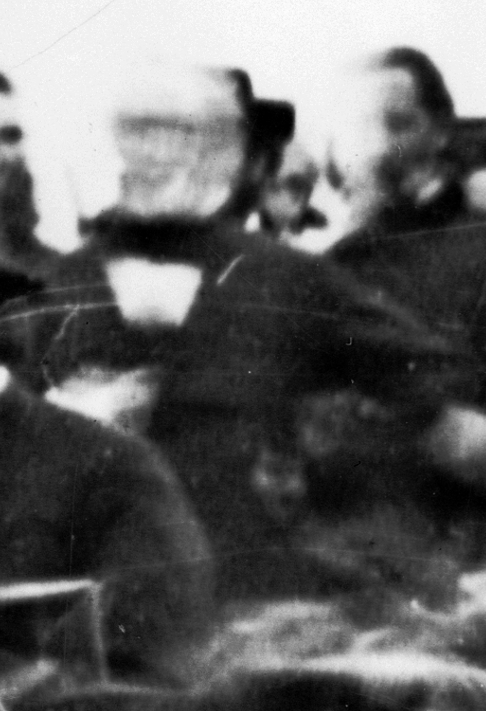 In its third usage, Burns filmed a very tight shot of an area on the speaker’s platform and had his camera zoom in towards the face of Abraham Lincoln. Here is a capture of Burn’s tightest shot from the remastered film in HD available at www.pbs.org, placed side-by-side with detail from a Library of Congress scan (at right). Just a small faux pas here because the camera those men used was not equipped with a shutter. Rather, an exposure was created simply by removing and replacing a cap over the lens. Crude home-made drop shutter lenses were then a great rarity. The story Mr. McCullough described is a combination of two accounts published more than 30 years after the event. Those accounts spoke to the presence of a photographer right in front of the platform who failed to take a picture of Lincoln while he stood and spoke. To be clear, neither those accounts nor Mr. McCullough’s narration relate in any way to this photograph. 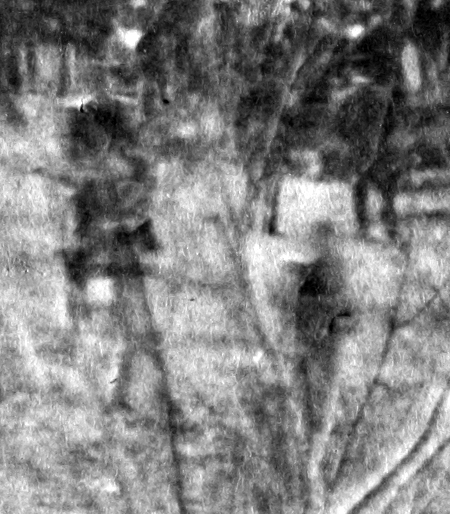 Bachrach wrote in 1916 that “I took the portable dark-room and [went to Gettysburg], and did the technical work of photographing the crowd, not with the best result while Mr. Everett was speaking.” That is exactly what the photograph used by Ken Burns and showing Lincoln depicts: Edward Everett standing and speaking (see him in blurred detail, below at left). Mr. Bachrach made no mention of attempting to photograph Lincoln while he spoke or even after he returned to his seat. It is logical that he would have mentioned it had he done so. Fell free to share with me what you think. There’s something about that picture that draws me strongly as an image of the Civil War! I enjoyed this very much! When I look at it, though, i have a little different take. What seems to be a gigantic 8X10 view camera may be the back of a soldier; similar to the one at right. Also , it doesn’t do any good to look through the glass on a view camera without a dark cloth over you…..you just can’t see anything! Maybe he accidentally left his darkcloth at home? In that case he would have removed an article of clothing to use……just like the rest of us do! Robert – Thanks for sharing your thoughts. Your idea of what is seen within this detail reveals that what is visible through the branches of a leafless tree is open to differing possible interpretations! But let me say some additional observations of my own in response. If what I interpret as a camera is in fact a man standing with his back to the camera, then he was gigantic (compare his stature to the man standing closer to the camera by the ladder). Also, that man was very “boxy” and had a huge pair of very square shoulders which extended down an equally wide torso. His shoulders, moreover, were both very shiny & reflective of sunlight as if adorned with enormous epaulettes larger than anything worn even by Winfield Scott! I don’t see the same type of reflection on the shoulders of any other men within this detail. 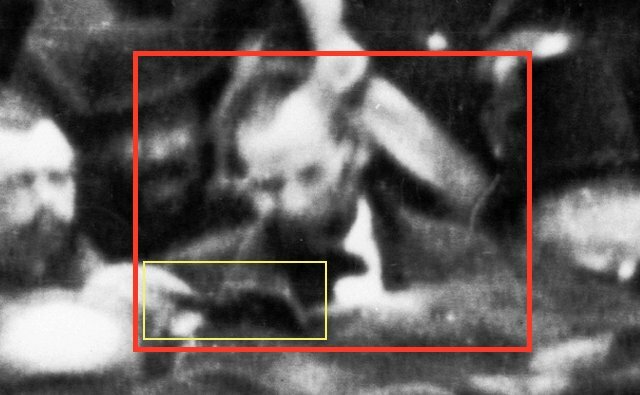 We also then would be left with the image of a man seated atop a ladder with his left arm extended forward for no apparent reason, his right arm obscured from view, and another man standing near him adjacent to a boxy-looking object which appears to be on a tripod. I agree that the man whom I believe is a photographer seated atop the ladder does not have a dark focusing cloth draped over his head (there could have been one draped over a portion of the camera). Also, he might (or might not) have used such a cloth in focusing the camera before the prepped glass plate was placed in the camera. I say he might not have bothered with a focusing cloth because reports are that the sky was overcast before the dedication ceremony began and I believe that I have read that many outdoor battlefield photographers dispensed with their use. Also, he had no need for use of such a cloth draped over his camera (so-long as he was confident that his camera was sufficiently light-proof) AFTER completing the focusing process. He, therefore, could have been captured as he awaited the right moment to begin the exposure by removing the lens cap or perhaps he was captured in mid-exposure with his left hand extended forward grasping the lens cap. Who knows? My point is that the absence of a visible focusing cloth doesn’t mean the object isn’t a camera. Those are my thoughts; please feel free to expand upon yours! Thanks again! Also, I don’t see proud defiance in that confederate….I see an akward pose forced upon him by the photographer……just like we all do!